Turkey’s Energy Market Regulatory Authority (EMRA) has started works in order to ensure easiness of electric vehicles’ charging and billing processes. Turkey’s Energy Market Regulatory Authority (EMRA) has started works for the electric vehicles to be used more effective in terms of charging and invoicing. According to the information from the EMRA, the body has speeded up the works related to the electric vehicles which would make up more different and more economical alternative to the transport sector. While the regulatory body deals with charging of the vehicles and billing transactions, it also makes precautions for possible disorders that might appear in the technical and economical applications. While having taken advancement about the technical effect of the electric vehicles at the charge stations and billing transactions through examinations and evaluations, meanwhile the system search for charging of EVs at home, street and business place. The system takes based on charging of the EVs with current electricity grill infrastructure. The EMRA will clarify the rules about how to use EVs in line with point of views and suggestions might be obtained from public opinion and sector as well as the entire shareholders. Berkan Bayram, the founder of Turkish Electric and Hybrid Vehicles Association (TEHAD), said the automotive firms had added electric and hybrid vehicles in the new models last year. Stating the increase happened in the model range last year would also happen in the production number in 2017, Bayram said, “Increase in the sales of electric vehicles and appearing much more on the roads herald that the charge stations will also increase.” In order to spread of the stations, Bayram said, “Swift charge points should be set along with autobahn, the stations should be multiplied at the shopping malls and similar places. Quick charge points should be made up in the regions where traffic congestions happen in cities. After being determined pilot regions, the compulsory charge stations should be set up at the fuel oil stations. 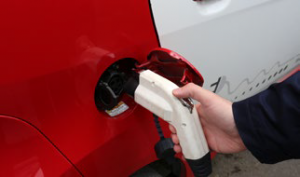 Special charge stations should be set up for fleets and rental cars. Online billing and data tracking infrastructure should be improved in order to install the charge stations and incentive mechanism should be encouraged so as to consumers to prefer zero emission transport.” The sales of hybrid vehicles have reached by 950 units through increasing ninefold in 2016. In 2015, as the number of 225 EVs and hybrid vehicles so9ld in 2015, this number raised by 950 units in 2016. The most interested model was Toyota Yaris in hybrid automobile market last year.